Actor, singer, composer, story and screenplay writer and film maker. The Late Shri Nath Tripathi was a man of many parts and talents. Many creative artistes have achieved greatness and immortality in the Indian film industry but only a few have displayed the range of versatility that S. N. Tripathi did with such consummate ease. S. N. Tripathi's main field of endeavour were the much-neglected, much scorned mythologicals to which he brought an aura of credibility thanks to his scholarship and painstaking research. Of course, much more would be required before S. N. Tripathi's immense contribution to the Indian film industry can be assessed properly. Shri Nath Tripathi was born in a Brahmin family of Kashi (Benaras, U.P.) on 14th March 1913. His grand father Pandit Ganesh Dutt Tripathi was principal of Sanskrit Vidyapeeth, Kashi and his father Pandit Damodar Dutt Thakur was principal of Government high school, Kashi. He completed his education from Banaras. He did his B.Sc. from Allahabad. He took classical music training from V N Bhatkhande's Morris College of Music, Lucknow. He took light classical and folk music training from Maina Devi, Lucknow. He earned himself the degree of 'Sangeet Praveen' from Prayag Sangeet Samiti and 'Sangeet Visharad' from Morris Music College. He went to Bombay and joined Bombay Talkies in 1935 as a violinist. He then joined music director Saraswati Devi as an assistant at a salary of Rs. 100 per month. He got his first break in Jivan Naiya as a singer ('Ae Ri Daiya Lachak Lachak Chalo..') in 1936. Jivan Naiya was also the first film of Ashok Kumar. He left Bombay Talkies in 1938, his last film with Bombay Talkies was Bhabhi (1938). In 1939 he got his first independent break as a music director in 'Chandan', which ultimately got released after two years in 1941. 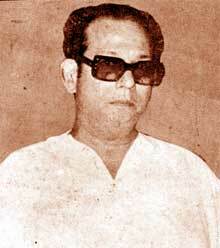 He composed his first song 'Nanha Sa Dil Deti Hoon..', sung by Rajkumari and Tripathi himself. He got his first success as a music director with Panghat (1943). Besides music, Tripathi also tried his hand in acting. He got his first chance to act, in a film called 'Ram Bhakt Hanumaan' (1948), he played Hanuman in the film. He acted in many films in between. But he persued his career as a music director. He created some beautiful songs for the films like, Uttara Abhimanyu (1946), Ratan Manjari (1955), Janam Janam Ke Phere (1957), Pakshiraj (1959), Rani Roopmati (1959), Laal Quila (1960), Sangeet Samrat Tansen (1962) etc. His first directorial venture was 'Ram Hanuman Yudhh' in 1959. He directed few more films after that, like, Kavi Kalidas (1959), Pakshiraj (1959), Rani Roopmati (1960), Amrit Manthan (1961), Piya Milan Ki Aas (1961), Sangeet Samrat Tansen (1962), Shiv Parvati (1962), Dev Kanya (1963), Maharaja Vikram (1965), Kunwari (1966) etc. He was a many-splendoured personality. He composed music, wrote dialogues and stories for many regional films also. He died on 28 th March 1988, in Bombay.